When we think of spring, many of us think of renewal, blossoming, and flowers, as the changing seasons push aside the colder days of winter and prepare us for summer. We also think of spring cleaning, but living in Florida, where the weather is gorgeous most of the year, many of us may no longer have the same spring cleaning rituals we may have once had when we lived in colder climates where wet weather and changing wardrobes meant that spring-cleaning was a necessity. 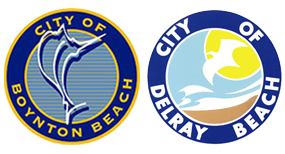 However, one spring cleaning ritual that it is essential to begin or maintain is to have your carpets and upholstery professionally cleaned by Chem-Dry. One of the major sources of indoor pollution is actually dirty carpets and upholstery. Even if there is no visible dirt or stains on carpet or upholstery, the top layer of the fabric works like a filter, often trapping irritants inside. In fact, fabrics and padding can contain allergens, mold, dust mites, and other irritants that can irritate allergies and asthma. While regular vacuuming and other good housekeeping practices can help remove these irritants from carpet, unless they are professionally cleaned, dirty carpets can contribute to indoor air pollution. A cleaning process that is tailored to reduce the presence of allergens, bacteria, and other irritants in your carpet will result in improved air quality. Of course, not all professional cleaning services offer the same quality of cleaning for carpets, upholstery, and air. 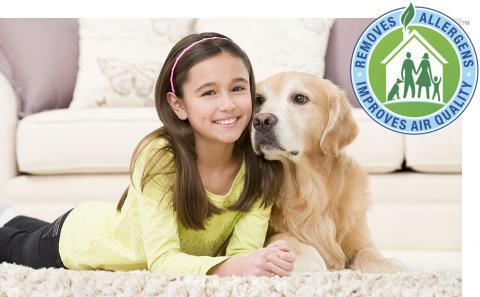 Chem-Dry uses a patented hot carbonating extraction process that lifts allergens from carpets and upholstery, resulting in a more effective cleaning process that reduces a greater percentage of allergens and bacteria than its competitors. 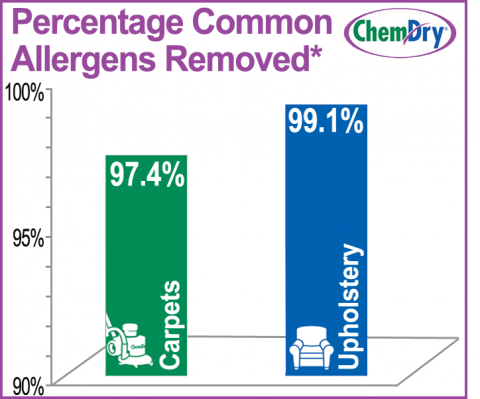 This process is so effective that an independent laboratory study found that carpets cleaned by Chem-Dry had 97.4% of common allergens removed from them, while upholstery had 99.1% of common allergens removed from them. These allergens include some of the ones most likely to cause reactions in people, like pet dander and dust mites. Of course, allergens are not the only problem in carpets; bacteria also presents a significant health challenge for many people. 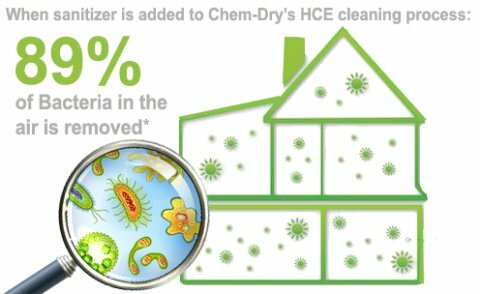 A Chem-Dry carpet cleaning removes about 82.3% of bacteria from carpet, which results in an 89% reduction in airborne bacteria rates. Given that there are about 200,000 bacteria in every square inch of carpet, such a significant reduction in rates is clearly going to improve air quality and reduce the risk of illness for you and your family.